Stockport, silly. Near to the A6(M). Yes, you did hear me right. OK, you're going to have to explain this a little better. I thought that I might. This is possibly the most confusing pair of motorways ever devised, so bear with me. There are two separate motorways that have been proposed that have been allocated the number A6(M) in Stockport. Even more confusingly, they are both described as "Stockport North-South Bypass". More confusingly even that that, there's very little time difference between this version being cancelled, and the "other" one gaining the A6(M) and Stockport North-South Bypass name. As you can imagine, this means that research is a complete nightmare, as you're never entirely sure as to which route is meant. There are even examples where commercial mapping shows both routes simultaneously, both marked as A6(M). So, what route would it have taken? As you can tell by the way I've put (West) on the end of the official title, this would have passed to the west of the A6 through the town centre. In the 1962 SELNEC Highway Plan, the proposed route would have started on A6 just north of the M60 at Heaton Norris near to Belmont Way, passing between M60 junction 1 and the Stockport - Manchester railway line. It is presumed that there would be a junction at this point, but that is not confirmed. It would then have headed south, west of King Street West before landing on the modern road system at the junction between Mercian Way and Shaw Heath, before terminating on the A6 at Longshut Lane. 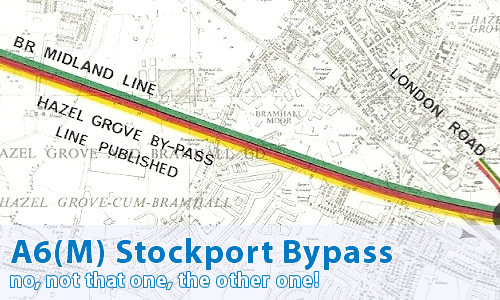 However, that didn't last, and before too long the route was extended wider and longer, taking in a larger arc that met M60 junction 1, and headed south through the urban area roughly along the line of Grenville Street and Stockholm Street, narrowly avoiding Stockport County FC's Edgeley Park ground on the way. It would then have followed the line of Rostrevor Road before cutting across the open space and crossing the A5102 near to Woodsmoor Lane before crossing the Cheadle Heath - Hazel Grove railway line and then running parallel to it before meeting the A523 and then finally hopping back across the the A6 near to the big kink at Mill Lane. That's pretty destructive, isn't it? It's actually not quite as bad as it seems - a lot of the houses in the way (though by no means all) are newer than the motorway proposal, so there would have been a much clearer path at the time. It's still pretty horrific in places, much more so than the route to the east of the town. It does, however, have one big plus over the later route.